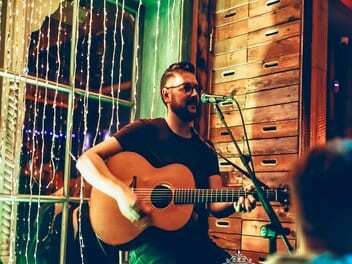 Sam Gribben is a friendly, charismatic musician from the humble town of Newtownards. He has been performing in venues across Northern Ireland from the age of 16, leading to over 10 years experience in the industry. Sam has experience performing in bars, restaurants, clubs, wedding venues, churches and festivals as both a solo act and in various band settings; mainly as the frontman of popular wedding band Fifth Avenue. This has lead to the development of a very diverse repertoire of songs and an ability to adapt to suit every audience. Sam will work personally with you to ensure your music is perfect for your day, wether that’s background ambience or a little lively afternoon sing-song! With Sam behind the mic, you can enjoy your day with confidence that your music will be exactly how you like it!